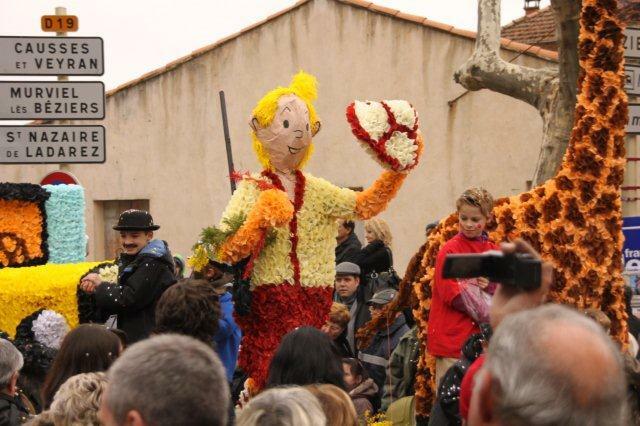 … takes place each year on the second Sunday in February in the village of Roquebrun, in Languedoc. Why, I hear you ask? 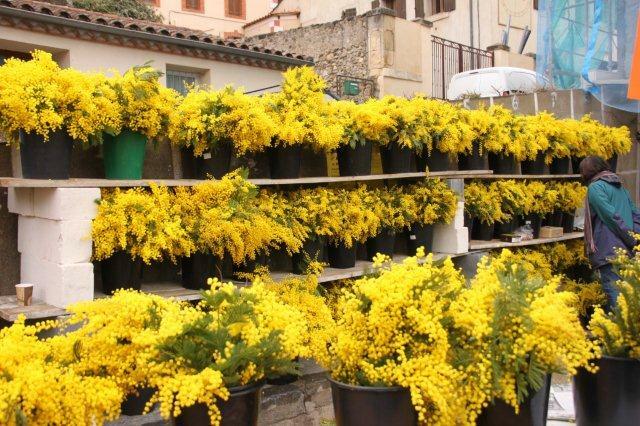 Well, Roquebrun, also known as Le Petit Nice because of its microclimate, is a perfect place for growing mimosa, and at that time of year the trees are in full bloom in Roquebrun and nearby. 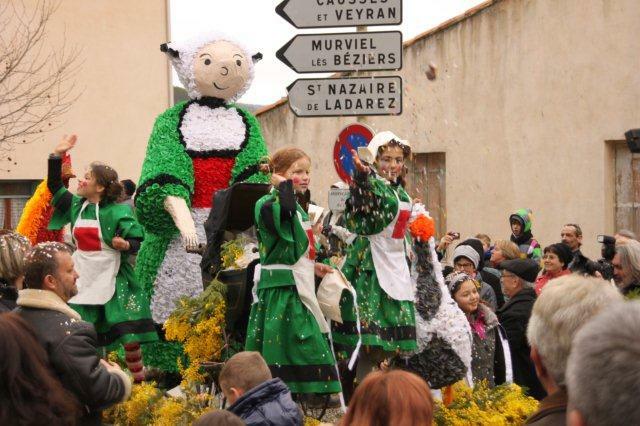 The Fete du Mimosa is now in its 22nd year and the main event is the parade of the decorated floats in the afternoon. 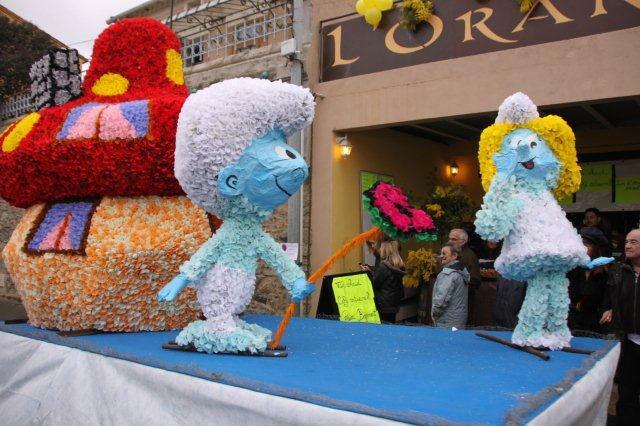 This year’s theme was “comic strip heroes” and we saw Tintin, the Smurfs, Becassine, Marsupilami, Lucky Luke, Boule et Bill, Bob the sponge, Titeuf and the Simpsons, all made by the local association Les Amis du Moulin and decorated with over 100,000 colourful paper flowers over the course of the winter. 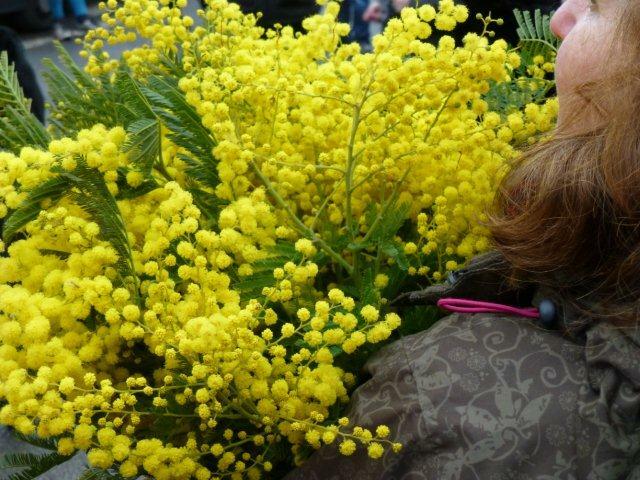 More about the procession later, first some impressions of mimosa blossom! 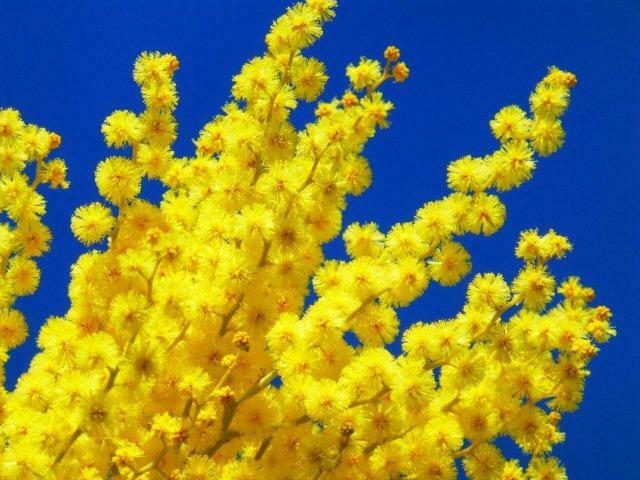 The yellow mimosa bloom seems to be especially pretty against a deep blue sky. 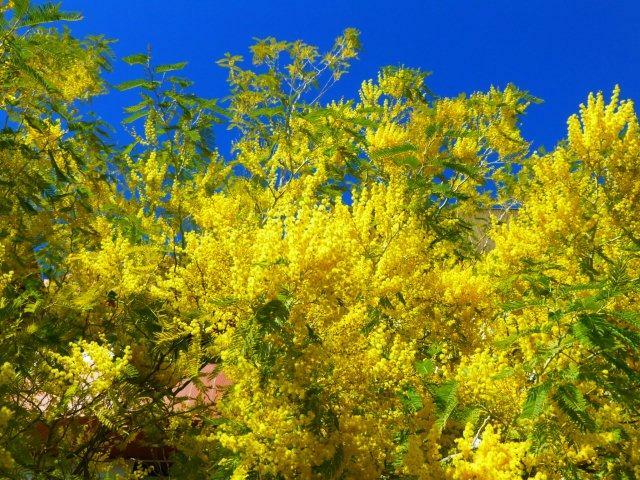 There’s something incredibly generous about a mimosa tree in full bloom, it almost shouts out that spring is only around the corner. 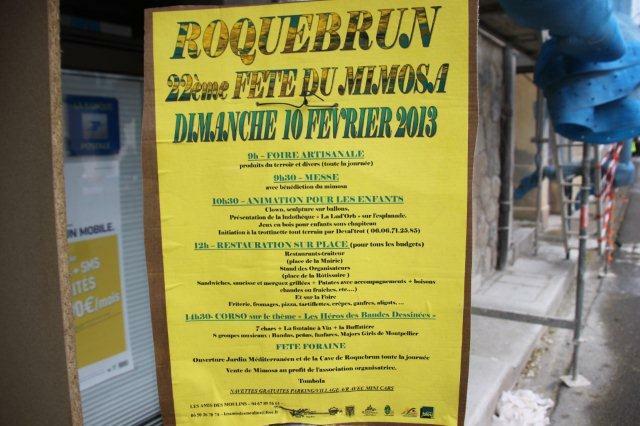 If you arrive for the fete in Roquebrun, you are most likely going to walk across the bridge. 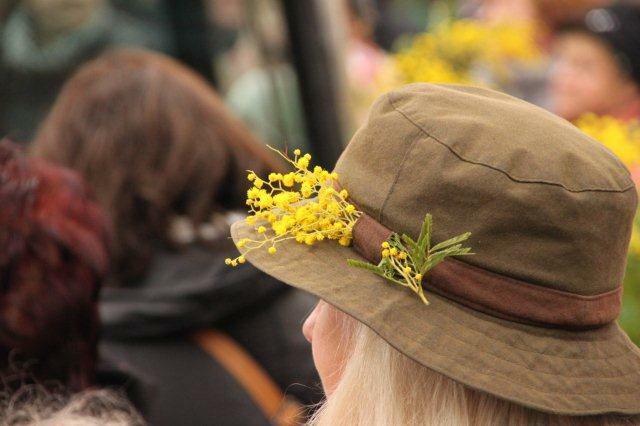 Straight ahead of you you’ll see the mimosa stall, where you can buy your very own bunch of mimosa blossom to take home. The scent is beautifully delicate and will make your house smell lovely. All along the main street are stands selling a variety of local produce and handicrafts, and there’s plenty of street food too! On the Place de la Rotissoire the organising committee had their own food stall, with a great BBQ to one side! 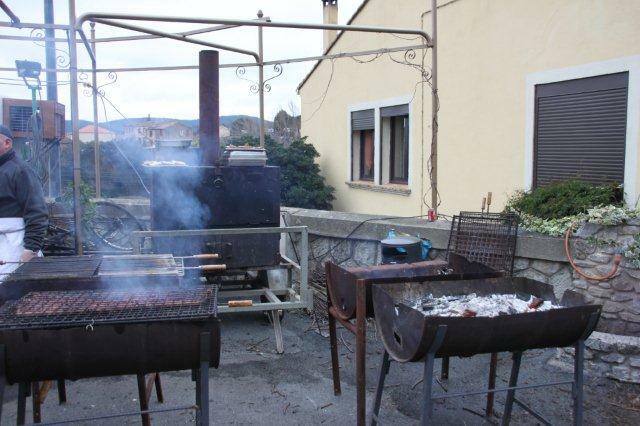 Those guys were prepared for some serious cooking! 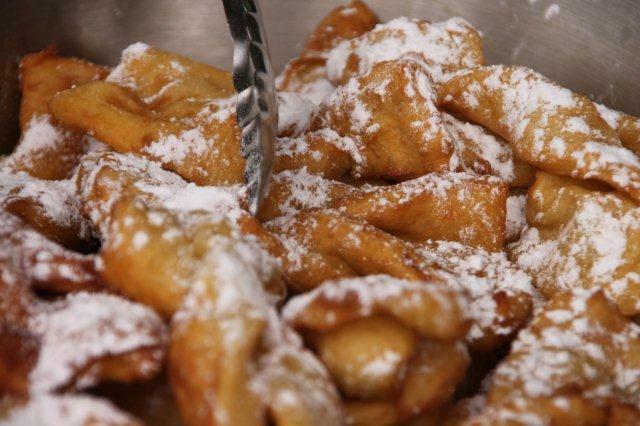 I found some delicious Bugnes at one stall, strips of dough, deep-fried and dusted with powdered sugar. Wikipedia has the English version of this as angel wings, but I also give you the French entry, in case you are tempted to make this! 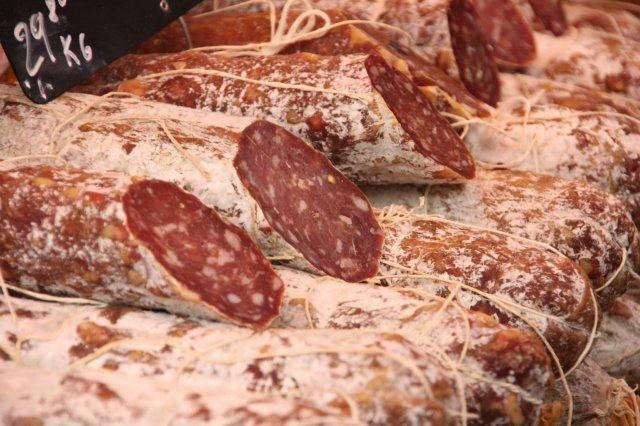 A search on one of the popular search engines will turn up a sleigh of recipes. 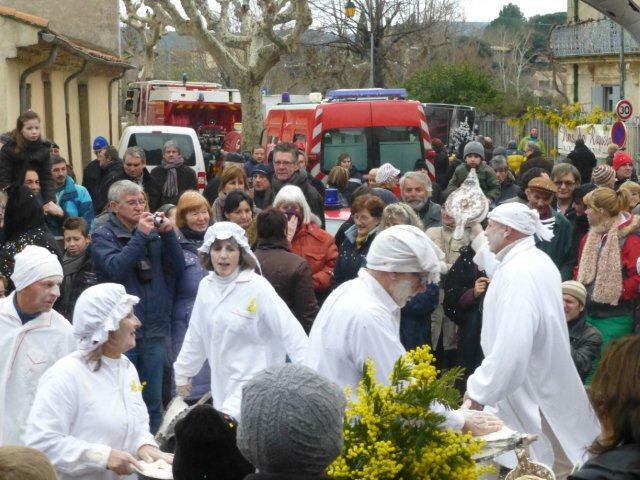 There were also the requisite sausages, along with lots of other food, from frites to pancakes and crepes made with chestnut flour. 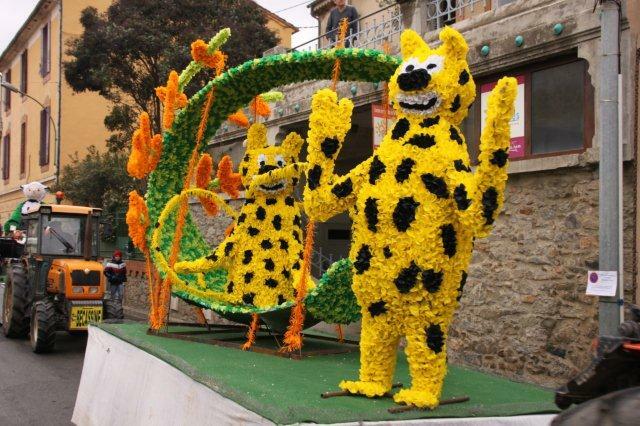 But back to the parade… I got a sneak preview as some of the floats were driven down the main road (there really is only one in Roquebrun) to the starting point. And they looked pretty good! After some lunch and a walk around the market I was ready to find my spot for the parade. 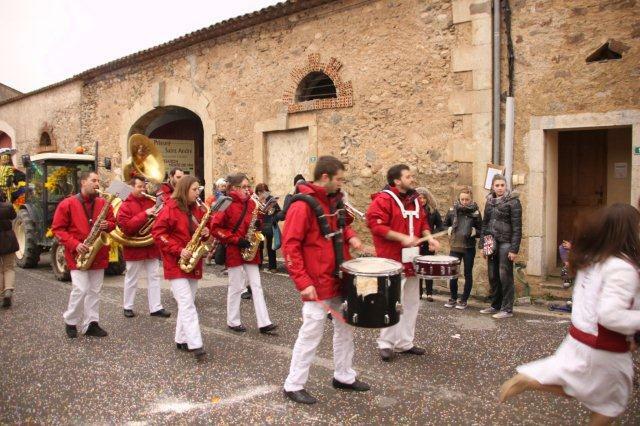 One of the walking bands entertained the waiting crowds for a little while, before heading off to the assembly point. And then, after some waiting, there was this almighty bang – it really made me jump. 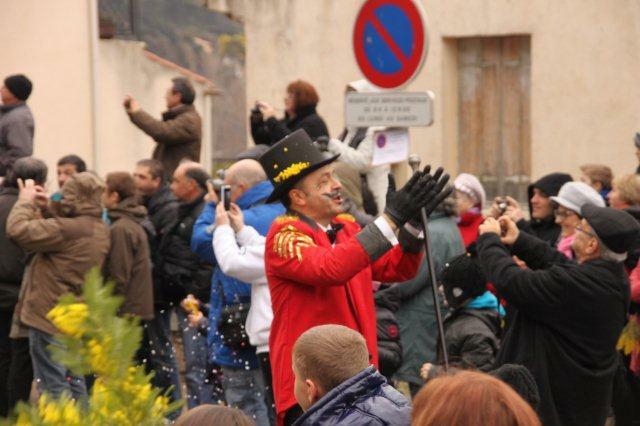 Apparently the sign that the parade had set off at the other end of the village!! 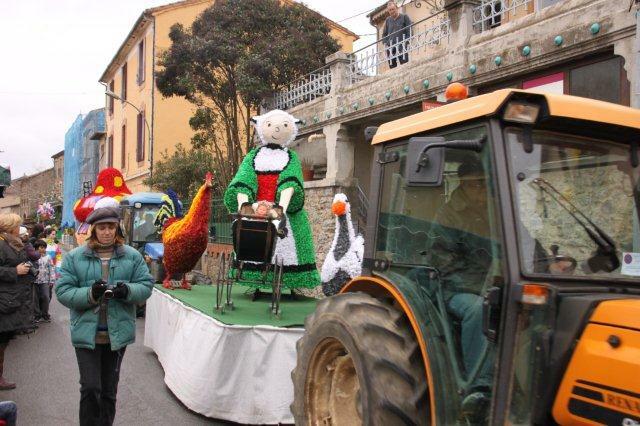 The master of ceremonies preceded the first tractor and it was Becassine who opened the fun! 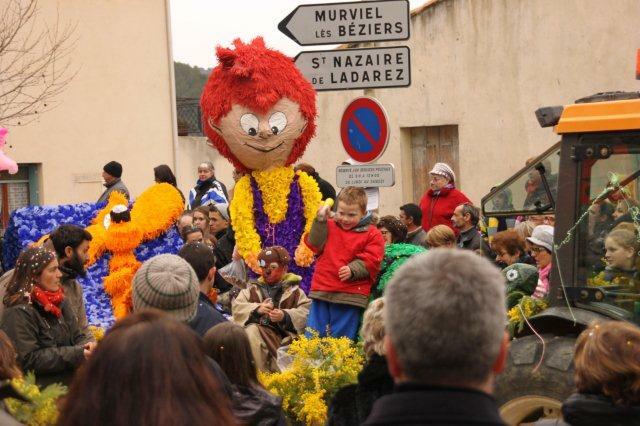 The floats and tractors were by now extravagantly decorated with mimosa bloom, and the floats were full of costumed children throwing confetti at the spectators (and each other!). 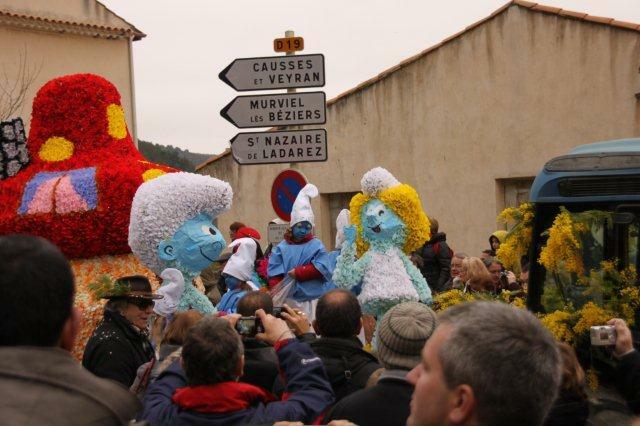 The Smurfs and Bill et Boule were next, and following each float was a band. 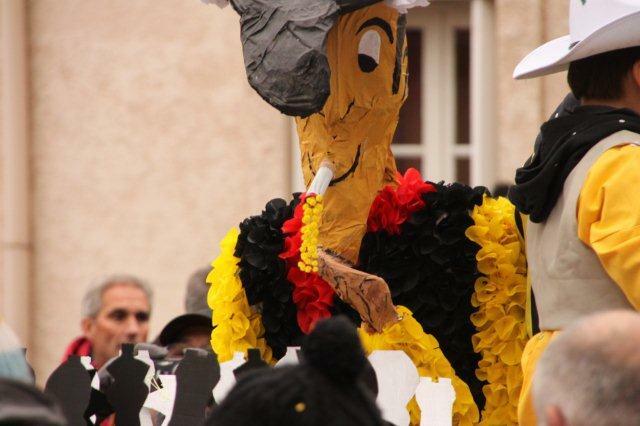 Lucky Luke came next, and in my book this float won the prize! 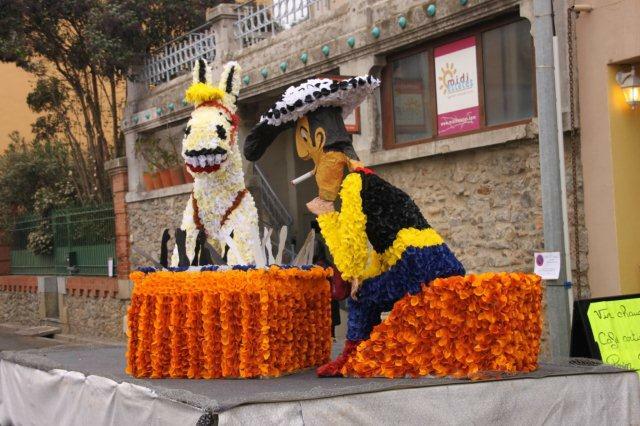 Check out Lucky Luke’s cigarette! 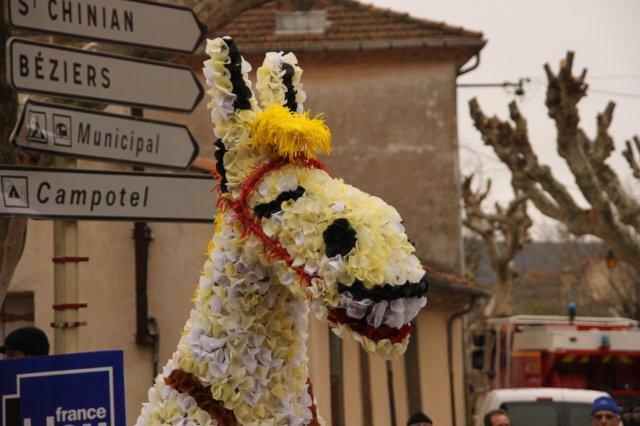 And the horse was having such a great time! 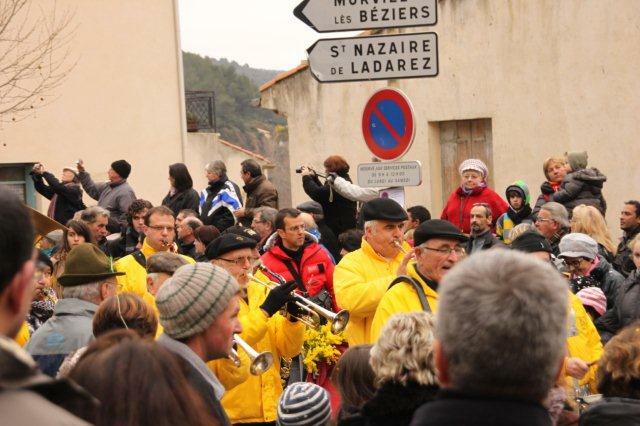 AND the band following were all dressed in mimosa yellow! 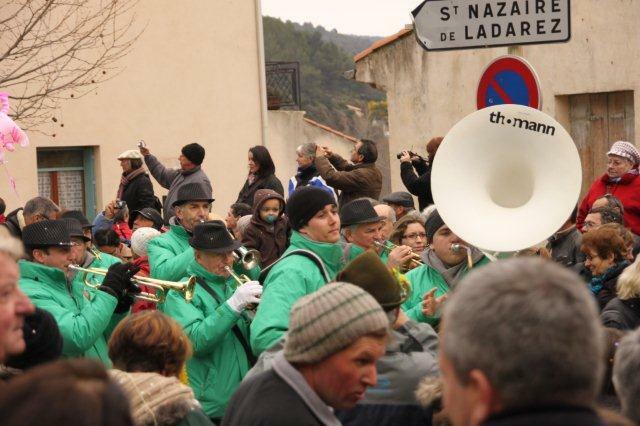 Tintin was next, followed by a brass band in green. 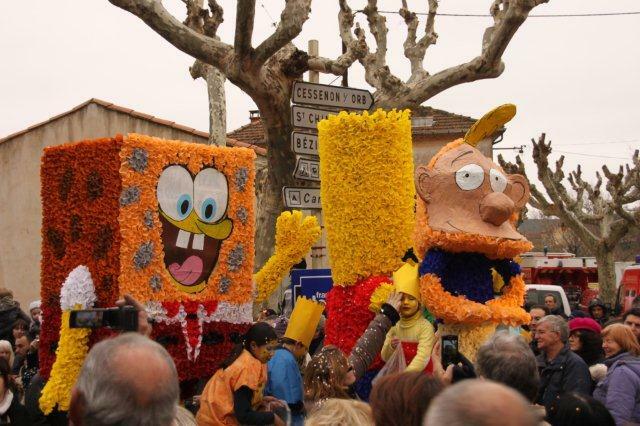 And finally there was a float with three comic strip heroes: Bob the sponge, Titeuf, and one of the Simpsons, I think it must have been Bart. Next came the Buffatiere and I doubt that you’ll have seen anything like it before. 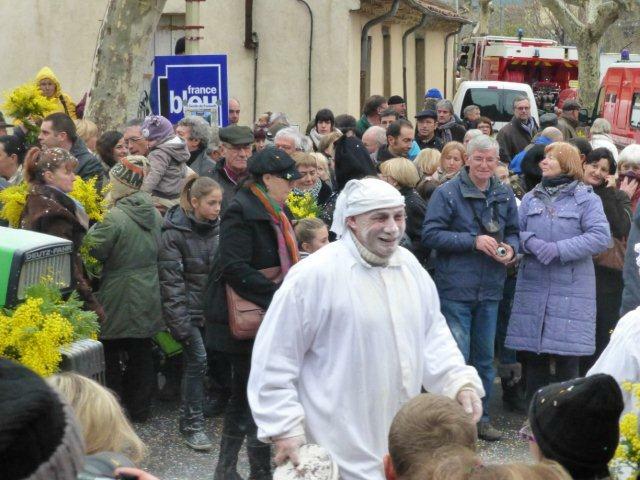 A group of dancers, dressed in white (night) gowns with white nightcaps on their heads, dance around a wheelbarrow full of flour, with bellows in their hands. Sounds pretty innocuous, doesn’t it? 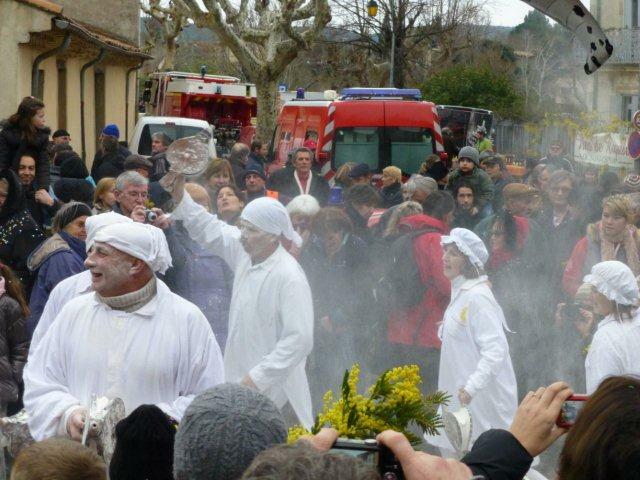 Well, the dancers get to have their fun by blowing the flour-filled bellows at each other and the audience, and giving some of the bystanders a floury hug. (For some history about the Buffatiere I found this website, in French only.) I took a brief video for your amusement. 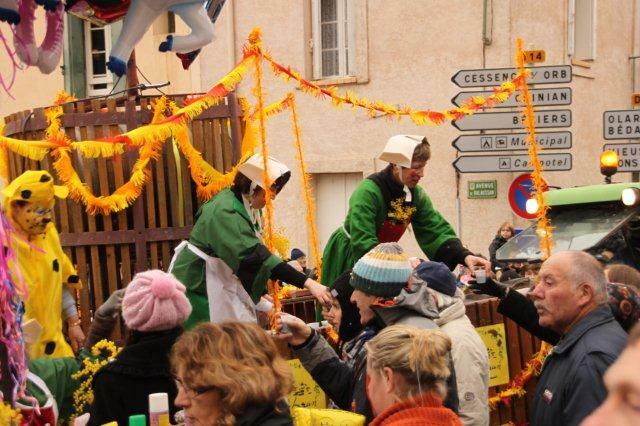 But the party wasn’t over quite yet – there came the Fontaine a Vin, a mobile wine bar kind of thing, sponsored by the Cave Cooperative, and distributing small cups of red wine all along the way, with the ladies all dressed up as Becassine. 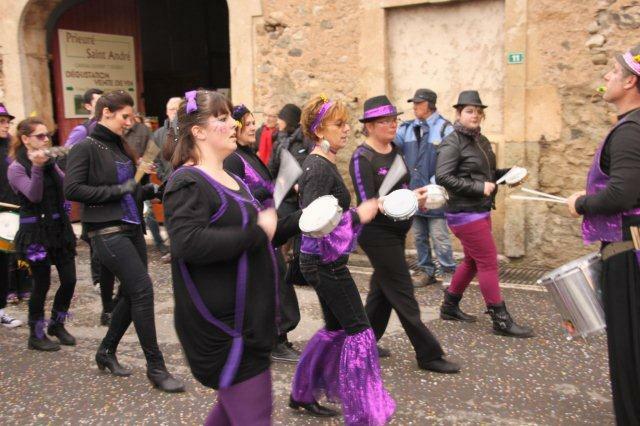 Now, with Roquebrun being a one-street-town, the whole procession went as far as the Cave Cooperative, where it turned round and came back again! 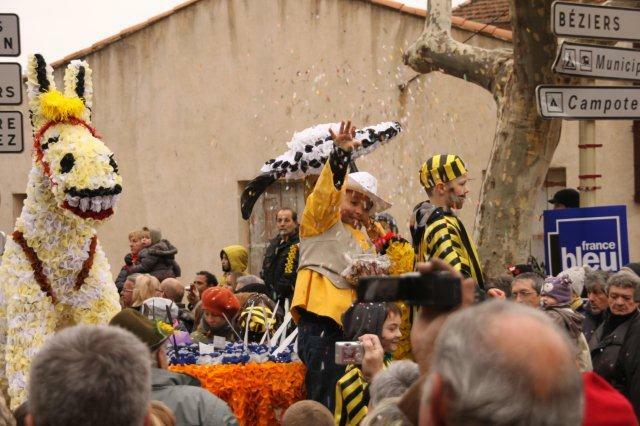 So another chance to wave at the children (one enterprising boy started to throw branches of mimosa from his float at the bystanders, as the confetti had run out :-)), listen to the music and get covered in flour. Oh yes, and then the wine came by again. One of the bands consisted entirely of drums, and they were pretty good, so I’m sharing a video with you. 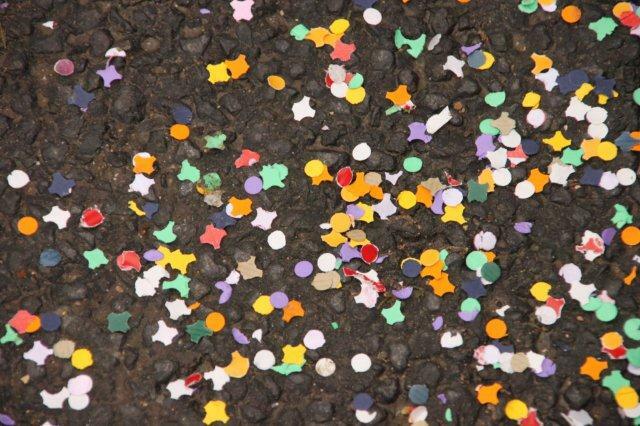 And then it was over for another year! !